18feb18 – Be first to name sea site, and it’s yours? Be first to name sea site, and it’s yours? THE ANSWER is No! — as the Philippines stresses in its objection to China’s naming five features of the Philippine (Benham) Rise, a 13-hectare underwater plateau some 250 km (155.3 miles) east of the Isabela coast. Grown sensitive to Chinese intrusions into Philippine maritime areas, Filipinos were alarmed this week by reports that Beijing had assigned names as early as 2014 to several features of the resource-rich rise while Manila was not paying much attention to it. As criticisms rained on Malacañang, presidential spokesman Harry Roque said: “We object and do not recognize the Chinese names given to some features….” He added that the Philippine embassy in Beijing has expressed its concern to the Chinese government. Public displeasure is fed by a perception that the Duterte administration has been soft on Chinese militarization of disputed isles in the West Philippine Sea, later compounded by Malacañang’s allowing China to conduct unmonitored “research” on the east (Pacific Ocean) side of Luzon. The Philippines formally claimed the rise on April 8, 2009, as part of its continental shelf in action filed with the United Nations Commission on the Limits of the Continental Shelf. The claim was approved in 2012 under the UN Convention on the Law of the Sea. On May 16, 2017, President Duterte signed Executive Order 25 renaming it “Philippine Rise.” Designating it as a “protected food supply exclusive zone,” the President banned mining and oil exploration in the area. Its having been named previously after Admiral Andrew Ellicot Kennedy Benham (1832–1905) by American surveyors who discovered it did not place the area under US control – in the same way that giving Chinese names to five of its features did not make them Chinese possessions. They are: Jinghao Seamount (some 70 nautical miles east of Cagayan), Tianbao Seamount (70 nm east of Cagayan), Haidonquing Seamount (190 nm east of Cagayan), Cuiqiao Hill, and Jujiu Seamount. Three of the names were submitted for approval in 2014, and the other two in 2016. Former National Security Adviser Roilo Golez, an Annapolis naval graduate who has remained active in intelligence circles, warned that if China were allowed to rename some rise features now, it would likely claim the entire region later. “That’s what I anticipate. This is a long-term objective for them, maybe 10 to 20 years,” Golez said, noting that has been China’s effective strategy in the South China Sea. • Philippines as another Chinese SAR? The natives of these alluring islands have had centuries of contact and commerce with their Chinese neighbors who came to trade valuable and useful items. On their navigation maps and logs, they must have referred to these islands by some names. >Ma-I — According to the Zhao Rugua book Zhu Fan Zhi written in the 13th century during the Song Dynasty, there was a group of islands in southern South China Sea called Ma-i (Pinyin: Máyì). The island group was later invaded and renamed, and identified by the Spaniards to be the island of Mindoro. Ferdinand Blumentritt in his 1882 book, Versuch einer Ethnographie der Philippinen (An Attempt to the Study of Ethnography of the Philippines), said that Ma-i, which means “country of the Blacks” was the Chinese name of present-day Mindoro. Some historians claimed, however, that Ma-i was not an island, but all the south of South Sea islands groups and Manila itself, known then to be a Chinese settlement that was in constant contact with the Chinese mainland as early as the 9th century AD. Other accounts had it that Ma-i consisted of the Sānzhōu (“Three islands”) group of islands: Kia-ma-yen (Calamian), Bālāwàng (Palawan), and Pa-ki-nung (Busuanga). Aside from Sānzhōu, Ma-i also reportedly consisted of the islands of Pai-p’u-yen (Babuyan), P’u-li-lu (Polillo), Lim-kia-tung (Lingayen), Liu-sung (Luzon), and Li-ban (Lubang). It was said that these islands had contacts with Chinese traders from Canton (Guangdong) as early as 982 AD. >Lei– This was the name given by the Chinese to what is now the island of Luzon, originated from the Tagalog term lusong, a wooden mortar used to pound rice. 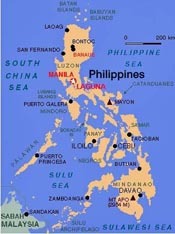 When the Spaniards produced maps of the Philippines in the early 17th century, they called the island Luçonia which was later spelled as Luzonia, then Luzon. If being the first to name a place were the basis of discovery, occupation and then possession, the Philippines may just qualify as another Special Administrative Region of China like Hong Kong or Macau. Not a bad idea, some Filipinos pushed to the limit have been heard to say tongue-in-cheek.